Greetings Farm to School Partners and Friends! Here is another exciting opportunity to learn more about farm to preschool! To kick off the fall and back to school season, Let's Move! Child Care is hosting a free webinar, Farm to Preschool: Digging in to Promote Healthy Eating and Physical Activity! Farm to Preschool is a growing movement across the country to bring fresh, nutritious foods from local farms to children in early education and child care programs. Farm to Preschool also includes activities that promote nutrition and physical activity like gardening with preschoolers, field trips to farmers' markets, and class food preparation and taste testing. 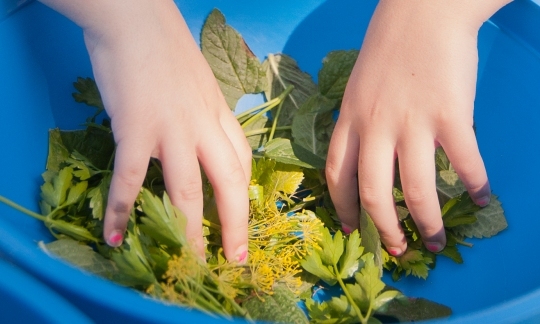 This webinar will be an opportunity to hear from Farm to Preschool experts and providers who are incorporating Farm to Preschool activities in their programs. During the webinar, you will learn about the range of Farm to Preschool activities, get tips and ideas on incorporating Farm to Preschool activities in your program, and find out about the free Farm to Preschool resources available online. Whether you are thinking about starting Farm to Preschool activities or looking for ways to expand your current Farm to Preschool efforts, this webinar can help you get a jump start. We want to compile a list of tips for working with little ones from the experts: YOU! Here's an example: Use flour to mark the place where you want the children to plant seeds or where you want them to plant the seedling. Flour is cheap and is not harmful to the soil. You are receiving this email because you are subscribed to the Farm to Preschool Subcommittee enews list. Would you like to update your email preferences? Never want to hear from us again?